Over the past few years there has been a marked increase in the purchase of old cut style diamonds. We more and more often deal with questions from consumers who are considering both newly minted old style cuts and authentic old cut diamonds. Of course, the diamond material is hundreds of thousands of years old anyway, but there are those who wish to go “new” or “old” and those who just want the old look. A further layer of unknowns crop up when a client wants to differentiate from an unrestored old cut from an old looking stone that may have been more recently repaired or lightly modified for one of several reasons. Then, there are those people looking for all the best look of an old cut in a newly minted old looking diamond, which has the high light return features available utilizing more recent diamond cutting knowledge and techniques that did not exist a 100 years ago. How can a consumer master all the knowledge needed to select a modern cut diamond and then add the additional knowledge they know they require aiding them in selecting the best old cut diamond? Since fewer old cut diamonds are in the market there are less to choose from and to compare. Because some may be brought into the market second hand and others are newly cut, the prices asked can be difficult to compare. Toss in the fact that many of these old cuts have lab reports from questionably reliable labs, which further degrade comparison, and you have a highly complex issue when it comes to making an informed decision. Believe me, I can’t tell which ones I’d choose sight unseen, and although some consumers are truly well informed and diligent, I promise you that they can’t know the unknowable better than a person who has spent the past 45 years working on making such decisions. Here is a link to my Cut Grade Chart for Old European Cut Diamonds. I think it highlights the best features at the upper ranges of 1 and 2, and it gives consumers a good handle on the weaker features as we get into the 3 to 4 range. Again, this is not the way to “choose” your ultimate diamond, but a way to assist you to “screen out” or to “inform” you of issues related to a particular diamond. A consumer recently asked me about a chip under a prong. The stone was an older cut. The photos do not show the chip clearly, but it looked smallish. Most can be fixed with a low cost and very little weight loss, but the symmetry grade may take a hit even if the clarity grade goes up a bit. Leaving a chip might create a weak place for further damage to occur. Fixing the chip and improving the symmetry to a decent level will lose more weight, and cost more to fix. It will not really change the value no matter what you do, but you surely can spend money on the repairs. The real trade off is that the diamond may be less likely to have further damage after it is recut properly. You still have choices as to cutting it and leaving it looking like an old cut, or in some cases, one could justify cutting it to a modern cut style. Few consumers want a modern cut when they are shopping for an older looking stone, but diamond dealers may well recut the right diamond to a modern look. This divergence in desires leads to more scarcity of some old cuts in the market. The newly minted old cuts being offered as branded cuts by several vendors do have the right old look. Maybe they are a bit too perfect for some of you, but that is what the goal was when they were designed. They are idealized antique cut stones. The authentic old cuts offered by other vendors have no brand or consistency of cut, but they may have price benefits attached since they are generally second hand purchases and not made from new rough. Conditions, such as abrasions and chips further confuse consumers with authentic old cuts. Newly cut diamonds tend to have the polish and symmetry details completely in good order. No doubt, compare and learn. Take the time and go to the expense of seeing a diamond in person whenever possible. Consult with an expert if you feel you have lost your way and need some help, too. There is no denying that old cuts have a rather distinctive look and their own place in the retail market. The individuality of old cuts adds levels of questions, knowledge and information required to get to the right diamond. What can an experienced appraiser do for you? The appraiser may be able to date the period in which an Old Mine cushion or Old European round was cut, can examine it thoroughly for damage and durability, and possibly determine if a stone is newly cut, old, or mostly old and just a bit re-polished. And most importantly, an appraiser can value the stone. Some appraisers are experienced with re-cutting and repair of diamonds and will be able to give you guidance in regard to any repairs that might be of importance. What can you do for yourself? A consumer can shop, learn, ask questions and compare similar diamonds. You have to learn how to use more than your wallet to understand this complex subject. There are wonderful examples of newly fashioned old mine cut cushions being sold by some vendors, which have all the visual attributes one may find enchanting and especially beautiful. The trick for a consumer who is dedicated to finding the best combination of “the deal” and the “most beautiful diamond” at their price range, is to have the patience to weed out the many third and fourth level stones which have visual and/or condition and durability issues. For those of you who like to see a side-by-side visual comparison, I have copied a few photos from online vendors who are also participants on Pricescope or have substantial inventories listed. 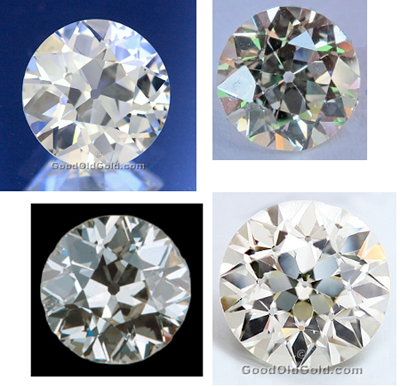 The two diamonds with black backgrounds appear to me to represent the appearance of what I’d call “average cut.” These two images were borrowed from educational pages on Blue Nile and not likely representative of what they may have to sell. These can be compared to three samples photos borrowed for our education from Jewels by Erica Grace, which are authentically old antique cut diamonds and three more borrowed from GoodOldGold.com. One image is of the newly cut, August Vintage Old Mine Cushion, and the other two images are of two finely crafted Old European cut diamonds. The consumer should note the life and individuality of Old Mine and Old European cut stones. They perform differently than modern cut round diamonds. Some may find this most attractive while the majority will simply prefer the look of modern cut stones. Everyone is entitled to pick what they ultimately prefer. In the second group of images (Old Mine Cuts), please note the appearance of total symmetry in the image of the newly-styled Old Mine cut from GOG with the deep blue background. These recently cut stones with their old cut configuration stand out in their own way. They have many old cut attributes and are a hybrid which conforms to the cut symmetry and polish of today’s modern stones. The have their own look. You be the judge and jury. 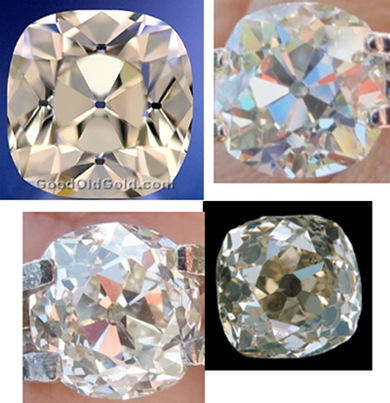 The Old Euro stones (four diamonds shown above) can be compared to the black background stone, which I’d call “average” cut, borrowed for your education from the Blue Nile tutorial on old cuts. Two stones from GOG (bottom right & upper left) and the one in the upper right borrowed from JBEG are all great OEC examples and excellent in cut. The JBEG diamond shows a few tiny girdle chips at about 1 o’clock. This light degree of wear is completely normal and not unusual for such older cut stones. In the cluster of 4 diamonds (above), there are two Old Mine cuts in the photos from JBEG (top right, bottom left) showing the typical irregularity of outline and symmetry, which is characteristic of an Old Mine cushion. You either love that feature or you don’t. The bottom right image is from Blue Nile and shows a generic and typical old mine cushion that displays the irregularities of these highly unique old stones. We realize not everyone will love the look, that’s a certainty. However, virtually no two are alike. You can find similar pairs for earrings, but they will not likely ever be identical. That and their overall appearance are what sets them apart. Again, you like them this way, or you might want greater symmetry, or the modern look of a standard modern cut diamond. We don’t want to make that decision for you, but information is key to making your best decision. In the upper left hand corner is a typical newly cut, old mine stye cut produced by Good Old Gold in their AVC Brand. Note the perfection of symmetry and faceting. It imitates an old mine cut with the perfection that our newer cutting technology allows. It stands out as something neither old nor exactly new. It is a different choice for that individual who wants this unique mix of appearance and perfection. Thank you to Good Old Gold, Jewels by Erica Grace, and Blue Nile for use of the educational images. Why are the ‘Best’ Cuts on the Edge of the Table-Bezel Zone? Why Aren’t Synthetic Diamonds Cheaper?